Five winters long, the young American photographer Lisa M. Robinson took pictures in the snow. Snowbound shows landscapes in which everyday objects – alienated and sunken in snow – civilize the natural surroundings. Traces of human existence set accents in the white landscape, delimiting it and often popping up in an amusing or incongruous way. A lonely hammock, a trampoline or a swimming pool are both echoes of the summer past and of personal memories. 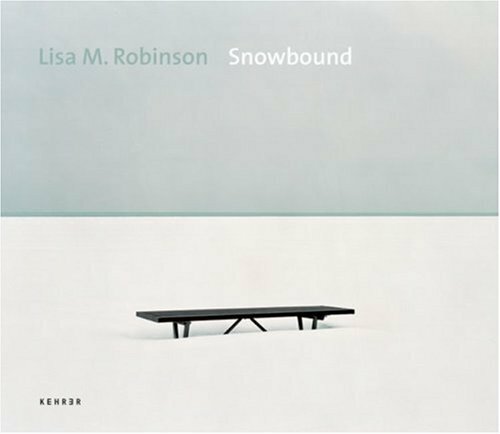 But Lisa M. Robinson is not interested in showing the obvious; instead, the photographer makes use of the many aggregate states of water – ice, snow, fog, water – as metaphors for life and transience. Limited to 75 signed and numbered copies. A custom white full cloth binding is the ground for an original tipped in photograph of 'Wish.' This limited edition book cover beautifully complements that of the trade edition. The book is Presented in a hand-made white clamshell box with a blue ultrasuede interior, and is accompanied by an original signed 8 x 10 c-print by the artist.